Red cabbage, a seasonal classic for its dramatic colour and deep, earthy flavour. When raw, its fresh crunch is welcome addition to salads and slaws. It’s also good quickly stir-fried, or cooked long and slow with apples for a classic accompaniment to game and roast meat. Discard any damaged outer leaves and the central core. Make a winter salad by shredding it finely and tossing through some walnuts, chopped apple, blue cheese and tangy balsamic dressing. 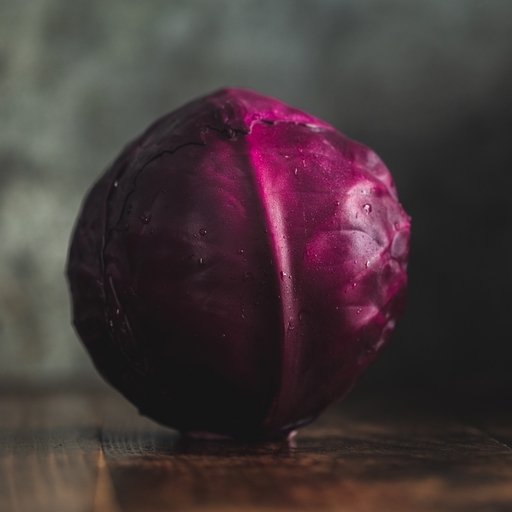 Or, for a classic side dish to roast dinners, chop up your red cabbage, 2 apples and 1 onion, combine with 50g butter, 1 tbsp brown sugar and 1 tbsp balsamic vinegar, simmer in a heavy-bottomed pan, then turn down low to cook for 2 hours, stirring occasionally. Keep in the fridge or a cool veg rack. It will last up to a fortnight. In season from July to December. If handled very carefully and harvested in good condition, we can keep red cabbage in cold store for several months. We grow cabbages on all our Riverford farms. They’re a really underrated British brassica and thrive in our climate.